Wheelchair picker for the Revolution Pool Lift. Designed for use in rehab facilities and hospitals, the wheelchair picker option allows users with very limited mobility to easily access a therapy pool for vital exercise and rehab purposes. It uses the same quick release functions as the other attachments and is easily interchangeable with the other Revolution options. Wheelchair sold separately. 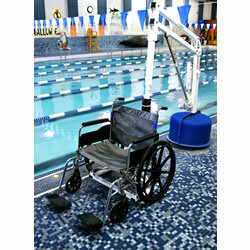 Please Note: The Revolution™ Pool Lift shall be setback no more than 28" when intended for use with the wheelchair picker option.